Password managers are a great way to keep your logins secure. Instead of using Post-It Notes or spreadsheets to keep track of your passwords, password managers like 1Password — and Apple's new password management options and API in iOS 12 — allow you to store unique and difficult to crack passwords like (jW2cBCJXXhF in a way that is easily accessible and secure. But one of the downsides to making your NYTimes password BKtat8uW(aJb is the difficulty in sharing it with someone else. There are lots of reasons you might want to share a password, and Apple has made it much easier in the new iOS 12 Beta. Now, you can share passwords with other people directly from the iOS Password Manager via AirDrop. On an iOS 12 device, open the iOS Settings app and go to Website & App Passwords. Then, select a login, tap on the password field and an option to AirDrop the login will appear. The login can be AirDropped to any iOS 12 or macOS Mojave device. Users on both devices are required to authenticate via Touch ID or Face ID (or a regular old password, depending on which Mac you have) before the password can be sent or saved. 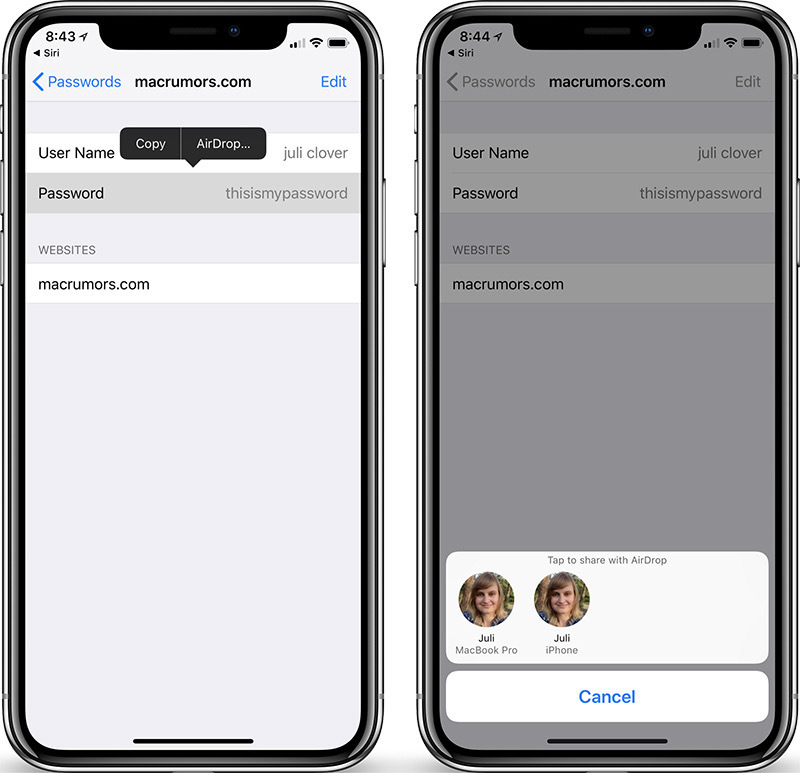 The new password management API (and this sharing system) is meant to streamline and simplify the way passwords work on iOS devices. Apple will automatically suggest strong, unique passwords, with iOS 12 offering the tools to create, store, and retrieve passwords no matter where an account is created. The new features work in both third-party apps like 1Password, as well as Safari. All of your passwords will be stored in iCloud Keychain no matter where they are created and they are synced across all of your devices. For third-party password apps, such as 1Password or LastPass, Apple is adding a new Password Autofill Extension that will let these password management apps to supply autofill passwords in apps and Safari, making it much easier to enter a password stored in an app like 1Password or LastPass. Also new in iOS 12 is a feature that lets you ask Siri to get your passwords. With a simple command like "Siri, show me my passwords," Siri will open up your iCloud Keychain after you authenticate your identity with a fingerprint, a Face ID scan, or a passcode. iOS 12 is available now as a developer beta, with public betas expected later this month and a final public release expected in early fall. Is this being serious and credible about security? You can either read your password out loud, or send it to them this way, in which it's encrypted. With this method, while they gain access, they never actually get the plaintext password. Much more secure than the alternative. iOS already offers the ability to share wifi password access with someone else remotely. That way you don't need to give them your wifi password but can give them access to it. This thread will be filled with people complaining "What if someone steals your phone, gets into it, and then sends all your passwords to someone‽" Just like someone stealing your iPhone X, pointing it at your face, and unlocking it as they run away, it'll never happen but MacRumors members will worry about it and see it as a huge issue. unique and difficult to crack passwords like (jW2cBCJXXhF in a way that is easily accessible and secure. But one of the downsides to making your NYTimes password BKtat8uW(aJb is the difficulty in sharing it with someone else. Alright, since nobody else has, I'll just drop this here. There's no real reason to make your password "BKtat8uW(aJb" unless you're already using a password manager and will never have to type it — or you just hate yourself. Why can’t we login to apps and websites using Touch/Face ID rather than having to use a password? I'd love for you to enlighten us as to why the Keychain is so secure. No, I'd love for YOU to enlight us about why you think it's NOT safe. It's been a cornerstone of Mac security, protected by AES-256, and also part of iPhone security. And yes, there have been the occasional trojans out there that have masqueraded as other things, and tried to fool people into logging into keychain to steal passwords. But as a technology, no, I haven't heard a thing about it being an insecure platform. Many, many systems will not allow a password like "correct horse battery staple". This is not useful advice since you can't use it everywhere. And those systems are stupid and authored by people with who just want the feel of security. That's kind of the point of the comic. My old work had some BS system that had all kinds of user-hostile requirements and made us change the thing every 6 weeks -- so I just used the same password over and over and changed one digit at the end. I'd write that digit on my monitor so I knew where I was. Hostility to the user results in people circumventing the system. Now I use a password manager so all of this is moot anyway, but I couldn't use one there and I had better things to do than learn a new "complex" password every 6 weeks. That's how I got my 1Password main passphrase. It's all words and there's one digit in it. It's being realistic. People share passwords for legitimate reasons and this is a way to do it that's more convenient than saying it and more secure than pasting into an email or text. I find my 1Password account works very well for this in that you can set up a shared vault and select specific logins to share with your family or team or whatever. I'm now considering to abdondon using 1Password, since AgileBits is pushing me towards a subscription based model. I'm on 1Password6 and they want $50 to upgrade to 7, or for me to switch to the subscription. This is the first paid upgrade for 1Password in 5 years. I fail to see how charging money for software they've developed is "pushing you towards a subscription". You said it yourself - you have the option to purchase a licence for 7 if you don't want a subscription. Or do you actually believe you're entitled to free upgrades for eternity because you paid once? Is it sharing the REAL password, like "12345678", or is it just an object that represents the password. I'd be worried about sharing a password with someone who doesn't worry about security. Shares the encrypted password. That way you don't have to read it out loud to them. They never have access to the plain text password. iOS 11 already allows you to do this with wifi passwords. Put your phone next to a friends and it'll ask if you want to share the wifi password.